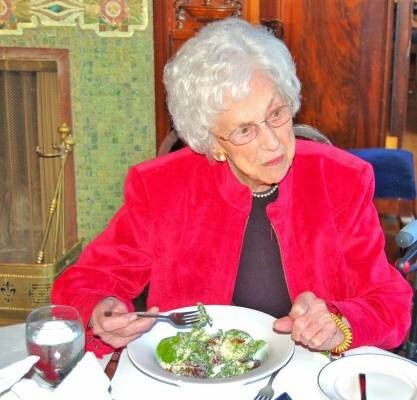 Rika at her 100th birthday celebration that was put on by the University Women’s Club of Vancouver in October 2011. UBC Alumna Rika Wright, born October 9, 1911 (BA 1933 and Diploma in Social Work 1935), passed away peacefully on Wednesday, July 27, 2016, at the age of 104 years old. Rika was UBC’s oldest living alumna and was profiled in UBC’s Centennial video where she shared her view of education, life and success in 2015. Rika’s advice to students was “Have fun” and “Do what you love” – all words she lived by. Rika was born and raised in Vancouver, BC and was the only one in her family to attend University. After completing her Diploma in Social Work, Rika discovered that social work was not for her but the experience allowed her, a shy young woman, to become more confident and outgoing. Rika shared a story of her first experience upon graduation from Social Work working for The Department of Family and Welfare where she had to go into the home of a young single Mother and was asked to remove the 8 year old child from the Mother’s care. This experience caused Rika to question her work because at the time she was 24 years old and didn’t feel she had enough life experience to take on the responsibility impacting the lives of others. Following her experience in Social Work, Rika went on to a long, rewarding and successful career of 37 years with BC Mental Health and retired at age 65. Rika was always grateful for every day and had a positive attitude no matter how she was feeling or what the situation was. Rika’s deep involvement with the University Women’s Club Vancouver (UWCV) spanned over 75 years and she was an active member from 1941 to 2015. Through Rika’s involvement with UWCV she transferred her zest for life, passion and care for others through the many activities and volunteer opportunities available, with her most recent passion involving bridge tournaments and round robins where she did very well. Rika has touched the lives of many throughout her long and full life. When asked to share one word she would use to describe herself, she felt that it would be difficult to narrow it down to one. Judging by the things Rika accomplished in her life the words tenacious, independent and spirited come to mind. Rika felt that the one value she places above all others is to live life to the fullest, which she definitely demonstrated throughout her life. Rika is survived by her nephews and spouses, 4 great nephews and 2 great grand nephews and her dear friend and confidant Jacqui Munro. View Rika Wright’s UBC Legacy Project interview video from 2014.